I have a ~$200 budget, and would like to find a classical replacement. Mine I can't find a picture of any that look like it but it is a light green almost grey sunburst to black acoustic electric. Any suggestions? 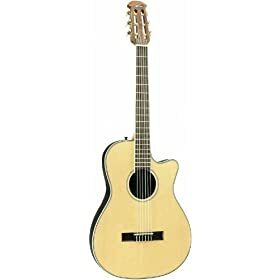 I am open to anything, I like the ovation for the thinner body, but really am open to any ideas. I've been checking out that Lucero too. Everything I read indicates it has a very thin sound except for when plugged. Which is to be expected from any thinling guitar. Seems to be good otherwise. I played one at GC and though it felt amazing, and sounded middle of the road... not perfect for sure but not bad. I doubt that's very helpful, sorry. But I plan to buy that same one when I can. Is there a reason you need an acoustic/electric? Because the electronics just add to the cost, and overall you'll get more bang for your buck quality wise by buying one without it, especially in the $200 price range, where the electronics are going to be "cheap" to begin with. It has a laminate top, those are always going to sound rather thin and quiet. It's black, so it's either painted or stained. "Real" classicals aren't black. To me, that looks like something Esteban would be hawking on late night tv. IMO, you'd be better off going for a solid top Yamaha in the $150 range. I cant speak too much for the Lucero myself, I used to work at GC and remember playing it, but it was years ago. I got the feeling that you typically get what you pay for. However, in order to offer you something constructive I researched some basic GC reviews for you. I would strongly consider Art Lutherie guitars (makers of Seagull, Godin, Simon & Patrick etc). I've never seen a seagull that was poorly made or overpriced...ALL OF THEM are well built and will last. In fact, I've NEVER come across a musician (real players) that have complained about them, and have met several that have had them for 15+ years, raving these guitars for quality and affordability. Seasoned players dont keep inexpensive guitars without a good reason. On a side note: you understand that Musician's friend IS Guitar Center right? if not, you can count this as your "something new" that you learned today. Thanks for the information! Also thanks for the heads up on musicians friend All the more reason why they would or should price match! yeah, its a great business scheme they got going...looks like "competition", but its not. Its exactly what Hardee's and Kmart should do: to look like they've been bought out and re-opened under a new look and name offering competitive price matching etc. In that price range, there are only three guitars that I have seen readily available with electronics. They are Carlo Robelli (and I would not recommend those), Yamaha (they are actually pretty nice players and made fairly well), Ibanez (cheaper than Yamaha). Yamaha classical A/E guitars run $350 range to start. You might get a much better deal in the used guitar listings on Musician's Friend. All times are GMT -10. The time now is 07:52 AM.